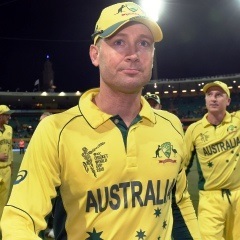 Melbourne - Skipper Michael Clarke scored a fifty in his last one-day international as Australia closed in on a World Cup final victory against New Zealand in Melbourne on Sunday. Clarke, who on Saturday announced the showpiece match would be his 245th and last ODI, raised a big cheer from a record Melbourne Cricket Ground crowd as he brought up only his second score over 50 in the tournament, having faced 56 balls including five fours and one six. Clarke and Steve Smith, his heir apparent as captain, were cruising along as Australia chased a meagre target of 184 runs for victory. The 33-year-old Clarke, who has suffered with back and hamstring problems, said Saturday he was quitting ODI cricket in order to prolong his Test career.